This is a recent request sent to our support center. Yes, we’ve done exactly what is requested. 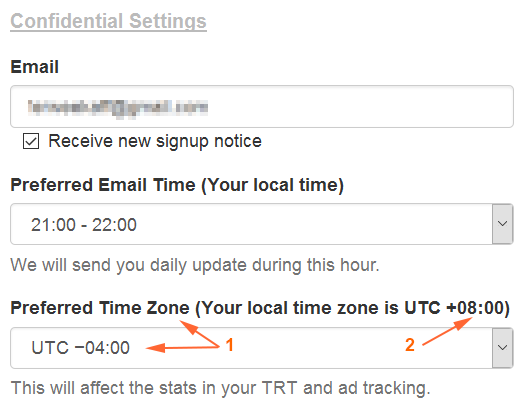 From now on, the stats in The Real Tracker (TRT) and LeadsLeap Advertising are displayed based on your Preferred Time Zone. How To Set Your Preferred Time Zone? Login to My Profile, look under ‘Preferred Time Zone’ (see arrow 1). The system will automatically detect your current time zone (see arrow 2). You can set your Preferred Time Zone to your current time zone or any time zone you want. Once you do that, the next time you view the stats in The Real Tracker or your Free or Pro Ads, the stats will be based on your Preferred Time Zone. Some websites prevent themselves from being cloaked, by throwing a blank screen or breaking out of the iframe when being cloaked. Cloaking is a means to hide the actual url of the website. Technically, this is done by placing the website inside an iframe, so that the visitors will not see the actual url in the browser’s Address Bar. Our TRT system uses such a system for advanced tracking, such as duration and response tracking. If you happen to track one of such links, you can now disable cloaking. 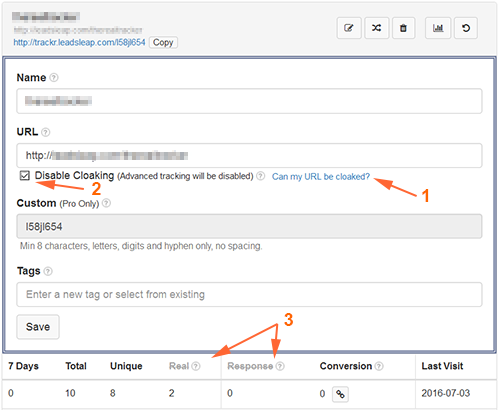 If you can see your website in the preview panel, it means your url can be cloaked. In this case, there is no need to disabled cloaking. Otherwise, go to Step 2. When you disable cloaking, the advance feature settings will be automatically hidden. You will also see that in the traffic summary, Real Visit and Response tracking are cancelled (arrow 3). This is to show you that these trackings are not possible when cloaking is disabled. I need to emphasize that most urls have no problem with cloaking. This means most of the time, there is no need to disable cloaking. Still learning ,but what i have read about Leadsleap is encouraging.. I have just discovered The Featured Posts what an eye opener they are. I always mess up when I need to adjust to the new time zone. With the help of this article it will be easier next time. i really liked the content of this website. I love the new site!! I know how much time, thought, and hard work it takes to bring a new site to fruition. You’ve done it, and beautifully! I’m raising my glass of tea to you in celebration of this enormous achievement!!! Hopefully, one day I’ll have the pleasure to clink glasses with you personally! I love your website. Thanks for share with us this content.